Hello COD users, I’m not out of date! I know this is old but I just made it for myself because every time I want to pass this game to my friends to play together we get problem with CD Keys. So Here is a Version for You also! Just don’t forget some Anti-viruses may find this Keygen as a Virus. don’t worry! 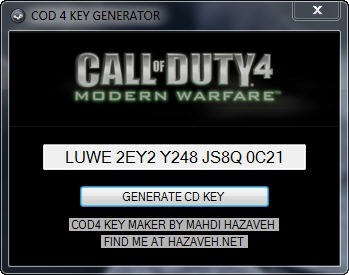 Posted byMahdi May 17, 2011 May 17, 2011 Posted inUncategorizedTags: 4, call of duty, cod, modern, warfare, whats up!